We recently found a couple yellow belly sliders in our garden. It seems that we must have disturbed their nest. My kids would like to keep them as a pet until they grow big enough to release them. Are there any concerns with taking a turtle found in the wild as a pet? 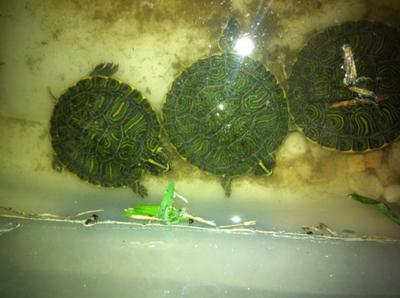 Also, what kind of accommodations should I prepare for this type of turtle(shelter, food, sun, water)? Hi, I have had a turtle, same kind, in my yard for the past week and a half. But mine is really big and i think she is laying eggs. So I might have some little babies like you have now. I would suggest putting a little bin of water in the grass (make sure they can get in, you may have to dig a little bit so it isnt as tall) and buy some turtle food and stick them in. I live in florida and its okay to have those kinds of turtles as long as they are for learning purposes. I think it would be okay if you kept them as long as when you let them go, you still provide for them in your yard until they get the hang of everything. The very best thing you can do is leave these wee ones on their own. They are wild animals and will do best when not disturbed. I don't know what the laws are in your area, but most places don't look favorably on people taking wild animals. You may be able to observe them in your yard from time to time.